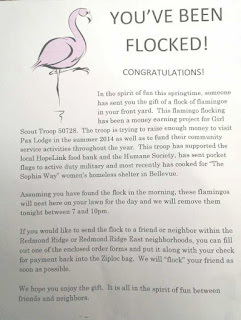 On May 25, 2013, I woke up to find I had been "flocked." 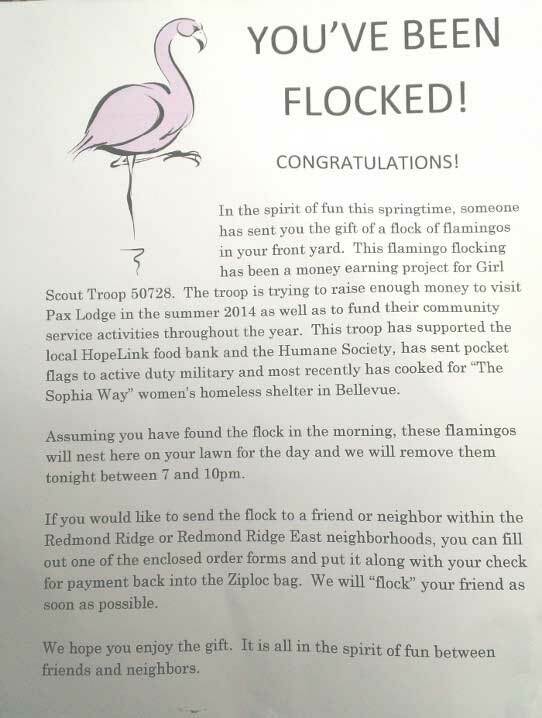 For those not familiar with "flocking", it is an excellent way of fundraising with no waste and relies solely on volunteer labor. 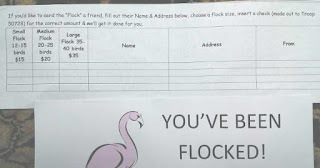 In our neighborhood, the flamingos are placed by a local Girl Scout Troop who arrive at a home after dark to arrange a prepaid number of pink birds on the front lawn of an local address designated on a form (see photo at bottom of page) filled out by a previous Flockee. 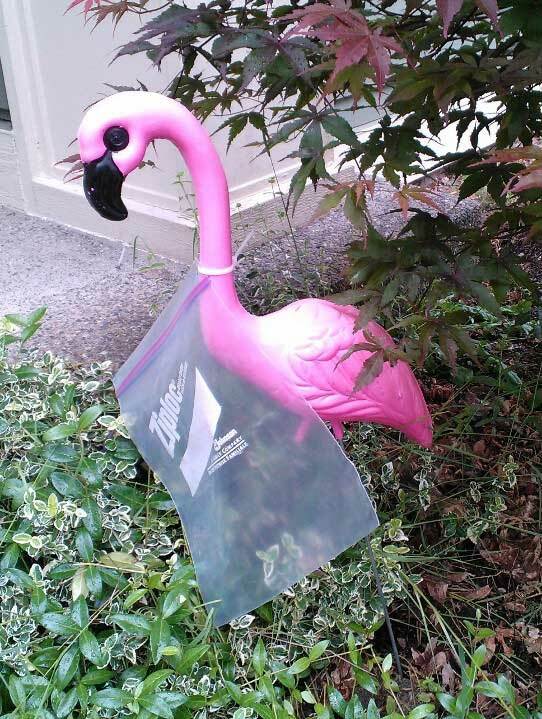 Included in the group of flamingos, is one large specimen with a plastic bag attached. 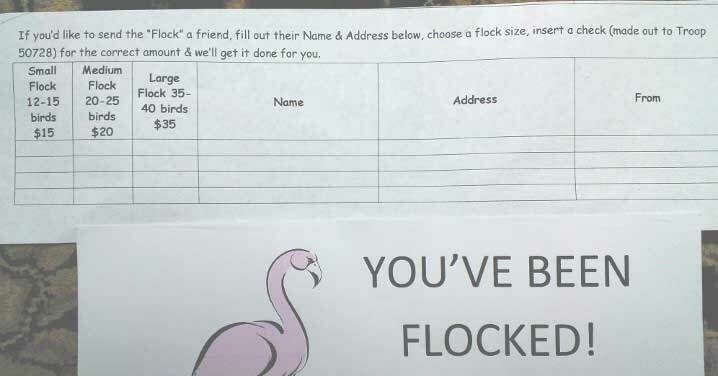 In the bag, is a letter (see photo) and form which will enable the recipient to surprise "flock" another person(s) of their choosing. The birds will stay until 7-10 pm that night and then the Girl Scout troop will pick them up and place them at the next destination. Even though we do not get to keep the flamingos, I found this to be a creative way to raise money and a cheerful way to start the day. 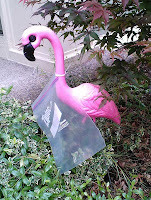 I've seen various flock sightings in the neighborhood, some very creatively placed flamingos peeking out of bushes, interacting with each other, and in my case, eating weeds (In my defense, there has been a LOT of rain the past few weeks. 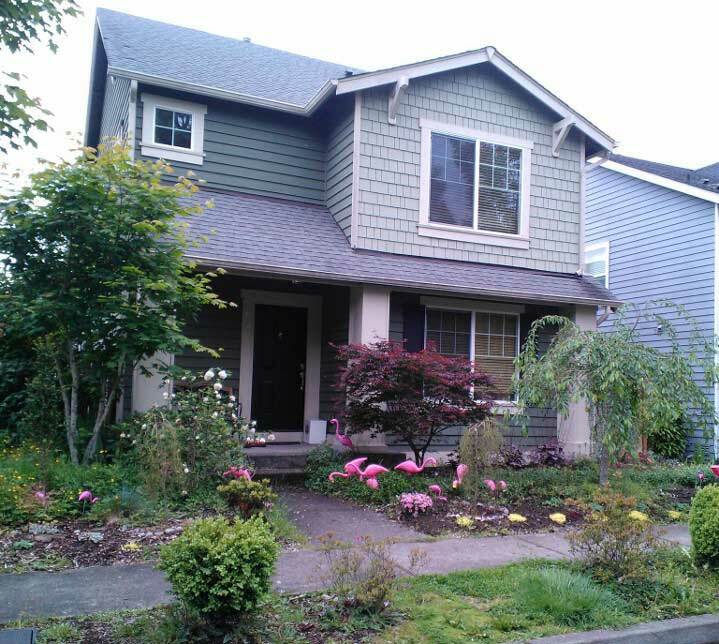 Okay, and yes, I tend to be remiss in certain landscaping duties. If only the rabbits that plague our yard would eat weeds instead of any plant that costs over $5!). 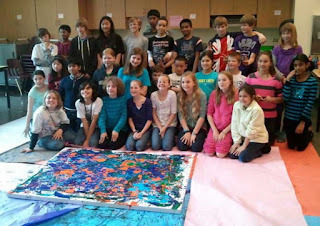 This was a great end of the school year Art Smart lesson for a 5th grade class. 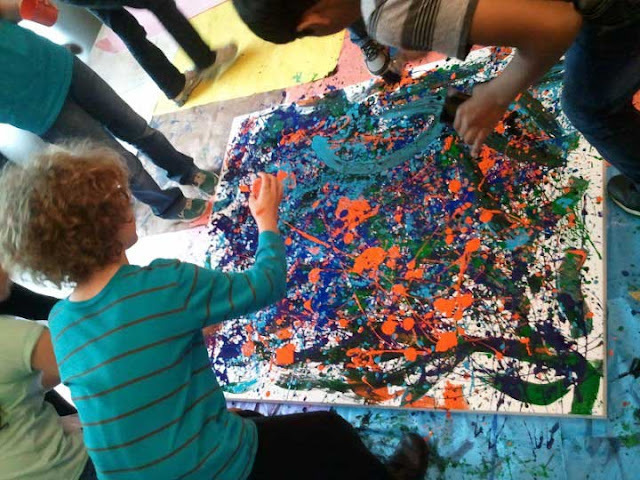 We looked at the paintings of Jackson Pollock and then had the students take turns in groups of 4-5 and spent 5 minutes each at the canvas. Tools used were sticks, brushes and paint filled bottles. Paint: Tempera. Support: Gessoed stretched canvas (bought as stretched canvas but may be less expensive if you do it yourself). Finished painting was donated to the school as a "farewell" present from the graduating 5th grade class but project could be done as a "thank you" to a teacher, parent, etc. Give parents a day or two notice about this project so that kids can arrive wearing old clothes (and shoes). 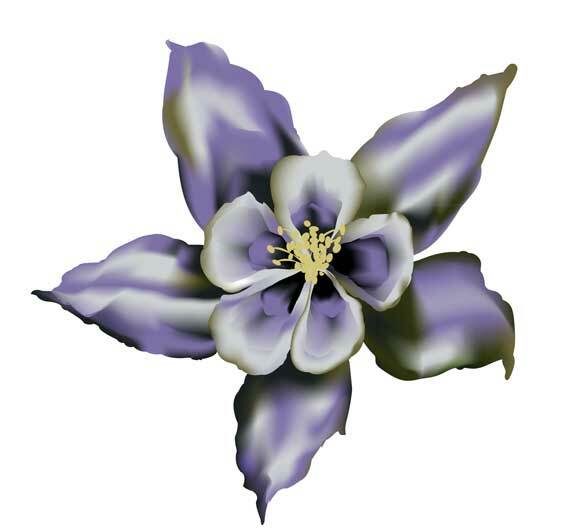 Tempera will stain (and if using acrylic, hardens quickly. Rinse immediately). We used tempera paint but if you have access to acrylic, I would use that instead. 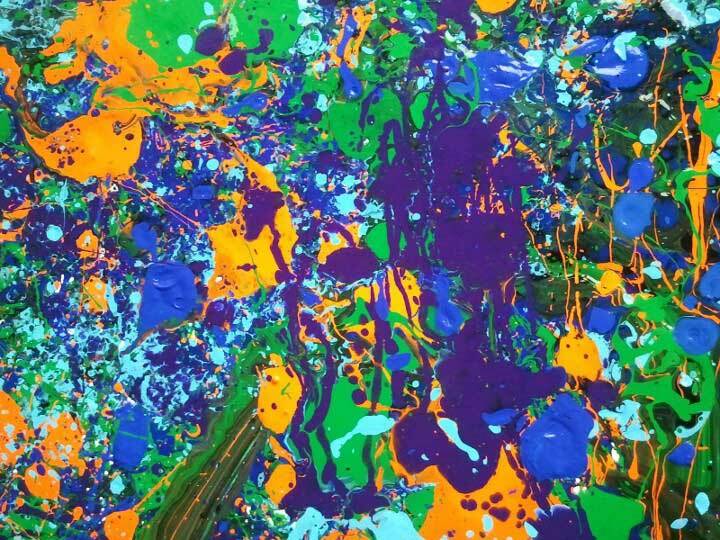 Tempera has a tendency to crack if applied too heavily. Prepare a space in advance where the painting can lie flat and undisturbed for 1-2 days. Have at least 2 (3 is better) parents/docents on hand. One to man the paint refill station. One to closely monitor the group at the painting. We had one child while the docent's back was turned take a large brush and write his name in 18" high letters on the canvas (luckily we had enough time to paint over it before the class end). Also to watch for kids that tend to get carried away with gestural strokes and need to make sure inadvertent paint fights aren't started. Also have drawing materials out for the kids not currently in the painting group so they have a way to occupy their time. Use 5 or fewer colors. Suggest one color per each student in each group. If I were to do this project over again, I suggest use the 3" brush only at the very beginning to cover the surface and then use the sticks/bottles. Otherwise, some of the detailed drips and spills may be painted over with the large brush later on. My last post discussed generating a limited color palette in Adobe Illustrator based off of 5 dominant hues in a photo imported into Real Colors (an application on Kindle Fire). After opening Illustrator, I entered the RGB numbers from each color and saved all five swatches in a customized palette. Using the colors from RC (and their tints/shades), I created the illustration below. All in all, I found it an interesting way to increase one's color knowledge - especially as an artist, there are times when certain hues reappear in our work (I know I often get in a color rut without realizing it). This was a great way to force myself to a limited and new palette. Real Colors also works with the camera on the Kindle Fire device so I can take pictures on location - a nice, easy way to capture color information locally.